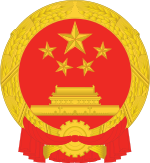 The Ministry of Education (MOE) of the People's Republic of China is the agency of the State Council of the People's Republic of China that regulates all aspects of the educational system in mainland China, including compulsory basic education, vocational education, and tertiary education. The MOE certifies teachers, standardizes curriculum and textbooks, establishes standards, and monitors the entire education system in an effort to "modernize China through education". It is headquartered in Xidan, Xicheng District, Beijing. The MOE stresses technical education over other subjects. The MOE was established in 1949 as the Ministry of Education of the Central People's Government, and was renamed the State Education Commission of the People's Republic of China from 1985 to 1998. Its current title was assigned during the restructuring of the State Council in 1998. ^ English home page. Ministry of Education (China). Retrieved on December 29, 2015. "Address: No.37 Damucang Hutong, Xidan, Beijing, P.R.C " - Chinese address: "地址：北京市西单大木仓胡同37号 邮编：100816"